The Fornax Galaxy Cluster is one of the closest of such groupings beyond our Local Group of galaxies. 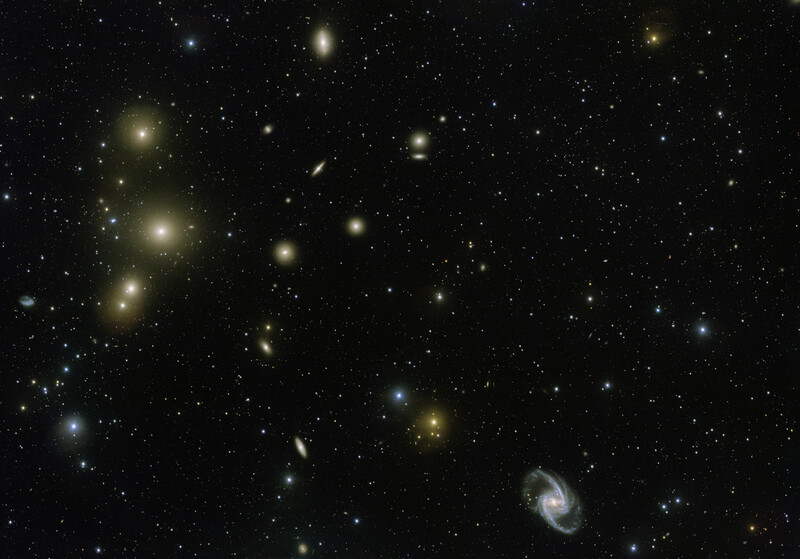 This new VLT Survey Telescope image shows the central part of the cluster in great detail. At the lower-right is the elegant barred-spiral galaxy NGC 1365 and to the left the big elliptical NGC 1399. Named for the southern constellation toward which most of its galaxies can be found, the Fornax Cluster is one of the closest clusters of galaxies. About 62 million light-years away, it is almost 20 times more distant than our neighboring Andromeda Galaxy, and only about 10 percent farther than the better known and more populated Virgo Galaxy Cluster. Seen across this two degree wide field-of-view, almost every yellowish splotch on the image is an elliptical galaxy in the Fornax cluster. A standout barred spiral galaxy NGC 1365 is visible on the lower right as a prominent Fornax cluster member.